Having a few health issues, he's prohibited from eating things made with too much fat and/or white sugar. But he loves lemons! Go figure. So it's always tricky trying to make a birthday dessert for him with his beloved fruit and no refined sugars. This year he wanted a very specific pie (recipe coming soon), so I was challenged a bit while trying to make it "dad friendly". 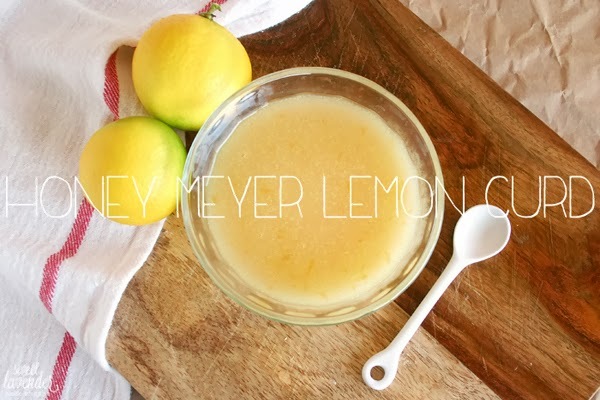 Enter this lemon curd. Actually, this Meyer lemon curd. Holy smokes guys...holy smokes. Continuing along with my resolutions this year, I developed this lemon curd recipe while trying to make a version that was "healthier", easier, and my dad could enjoy. Yep, no Pinterest for this, used my Canon camera to shoot, AND it's a clean food! Yay! Three out of five resolutions in one post? Pfffft. I got this. Can I get an "amen" about the Meyer lemons? I mean, they might be the best citrus fruit out there. Thank goodness my mom has a tree for the pickin! Free pickin' at that! And now that it's citrus season, her tree is bursting with them. I just love Meyer lemons, and their tart yet sweet juices! This curd has all the flavors you would expect in a good old fashioned lemon curd, but with the added bonus of being both refined sugar and egg yolk free! Plus, as we all know- anything made with Meyer lemons basically means it will be the best thing yet. It's slightly sweet and very tangy. A perfect amount of tartness for any of you lemon lovers. Oh, and it's easy to make. And...my dad loved. Boom. Remove from heat and pour curd into your bowl with butter. If you're worried about lumps you can pour through a strainer into your bowl. Mix in butter and allow curd to cool completely, stirring every so often. Curd will thicken up even more when cool. Store in an air tight container, in fridge, for up to 2 weeks. Thank you Jesus for making the Meyer lemon! This sounds soooo tasty...can't wait to try it out!